People have always been impressed with my digital colouring and I’ve wanted to create a book on how I colour my character art since my last year at uni back in 2007. Finally in 2013 I asked the Publisher of my previous titles if they’d be willing to work on such a project. It got the go ahead, but the idea was slightly altered to make it work. I was so keen to see it out there that I was happy to compromise here and there by dropping a section or two and adding in something else. I had originally wanted to create the page layouts also, but this ended up being assigned to an in-house designer. It took a while to complete- the deadline on it was around 4 months to submit both the text and images. I then needed a number of weeks some time later to revise the page layouts and re-check over the edited text. Initial planning took a few weeks. I had already created a 30 page BLAD (book layout and design) years ago, which helped speed the initial stages up and helped when pitching the idea. Fortunately, I also already had several finished works to contribute to the book, which would have otherwise taken a good 20 hours a piece. I worked my own hours- some days spending 15 hours solidly working, others just 4 or 5, but with 160 pages to fill up with well written, fresh content, it was never going to be a breeze. I guess all in, I must have spent a good 500 hours on it. I wanted the book to be one of the best things I’d ever produced, so was willing to go above and beyond to get it up to scratch. Unlike my previous book TAODM, Digital Manga needed about 55% more written content and 50% more image content. I also didn’t want to use a writing assistant or several image contributions from collaborators this time around so that the work would be 99% my own. I also took it upon myself to record several of the book’s character tutorials, convert them into time lapse videos, then upload them to a web page I’d created along with downloadable content. It may not be everyone’s cup of tea or it may not be the best instructional book in the world, but I’m really proud of the end result. I’ve checked out hundreds of online art tutorials, forums and videos over the last decade and know the book is covering all the necessary bases and more whilst drawing upon everything I’ve learned about Photoshop art creation since I started using it back in 2000. I’m sure a lot of people will just buy it for the pretty pictures but I really hope people out there get the chance to read it and make use of some of the content I provided. 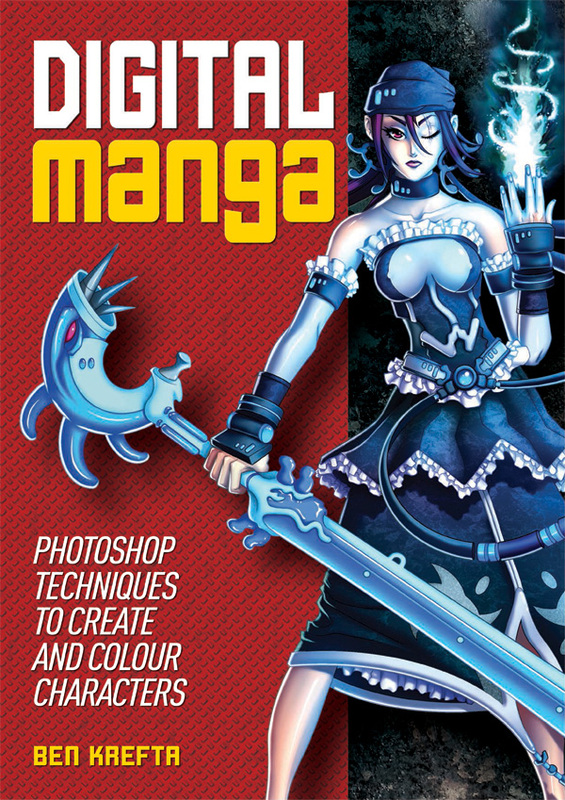 I really want people to learn something and for the book to help with their digital art endeavours. The book isn’t as perfect as I’d like it to be. Frustratingly there were several errors left in the book. These could have been resolved before it went to print had I been given the opportunity to check out a final proof. I imagine the publishing team were up against deadlines or problems of their own and not as invested into the project, so were not as willing to get it perfect. I will do all that I can to make sure many of these get rectified should the book get reprinted. I needed to spend a lot of time adjusting or advising upon the page layouts sent to me. There were an unacceptable amount of inconsistencies and some horrendous design choices- use of garish, clashing colours, tacky background images. I tried to think how the book would have ended up had I not insisted on overseeing the layout stages. I don’t yet know if this will be a problem or not, but I imagine sales won’t reach the same levels as my previous titles. While the book is, in my opinion, totally awesome and a huge step up from the last ones, I realize Photoshop isn’t as accessible to manga fans as a pencil and paper. It’s not something for complete novices either and at then end of the day, the book teaches how I work, which might not be to everyone’s taste. Communication was done completely over email. It was great to have a record of everything sent and received and suited my late working hours. Although there is this detachment whereby I don’t know what is going on their end. Are they also frantically trying to get everything done and staying up until the early hours to do so. Or are they not taking the project as seriously, slapping together a half-arsed job and calling it a day? It can be easy to fear the worst if there is a lack of face to face communication or if there’s a problem and I can’t talk to the designer, the sales team, the accountant etc. directly and instead everything is going through the editor.